Anaemia of chronic renal failure. AND related to non-myeloid malignant disease chemotherapy. Uses:- Erythropoietin, or EPO, is a glycoprotein hormone that controls erythropoiesis, or red blood cell production. Vintor Injection is a cytokine for erythrocyte (red blood cell) precursors in the bone marrow. Also called hematopoietin or hemopoietin, Vintor Injectionproduced by the peritubular capillary endothelial cells in the kidney, and is the hormone that regulates red blood cell production. 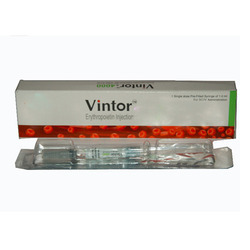 Vintor Injection also has other known biological functions. For example, VINTOR plays an important role in the brain's response to neuronal injury. EPO is also involved in the wound healing process.